You don’t want a plate of three different brie-style cheeses, or all blues for that matter. You want to create a progression from mild to intense flavors featuring a variety of cheese styles, origins, and milk types. When selecting each component for your board, remember that texture should be balanced, too. 2. Light-bodied reds go with everything. Pinot Noir is probably the most versatile food-pairing wine. Try selecting a lighter bodied one from a cool-climate region like Burgundy or New York’s Finger Lakes. A good Pinot will be herbaceous, earthy, and fruity with good acidity. Heavier wines like Barolo or Bordeaux don’t play as well with certain molds. Honey will always have a home with Blue cheeses, playing off the sweet and salty combination and its thick texture is luxurious on the palate. Fig jam works with just about anything, while strawberry preserves are a knockout with a nice alpine-style cheese like Comte. Get creative and try a caramel sauce or chocolate for your Goudas, Cheddars, Bries, and even Blues! Head on over to Gotham Magazine to read Dan’s full list! Get the word on the curd sent directly to your inbox! Founded in 1940 by Murray Greenberg, Murray’s Cheese is proud to be a New York tradition and part of the city’s rich food history. 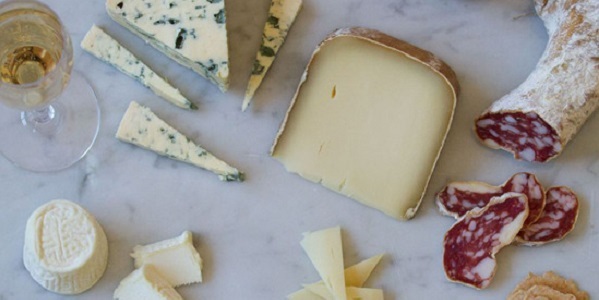 It’s a pretty safe bet to say that we’re cheese obsessed: our goal is to find the most delicious cheese and specialty grocery items from across the globe, teach you a bit about them, and then make sure you enjoy them. In 2008, Murray’s began partnering with Kroger to elevate Kroger’s specialty cheese program. Murray’s cheese shops can now be found in 400+ Kroger locations in 30 states. In 2017, Kroger purchased Murray’s Cheese in order to continue the mission of making specialty cheese available to everyone in America. Follow Murray’s on Facebook, Twitter, and Instagram or visit our website: www.murrayscheese.com.